Coming Summer 2016, enter the post-apocalyptic world of AMC’s “The Walking Dead” in an all-new year-round attraction. Prepare to fight for survival in a fully immersive journey as you navigate through a world overrun by hungry walkers. Follow in the footsteps of the human survivors as you battle your way through nightmarish iconic landscapes that bring the most popular cable TV show in history to life! 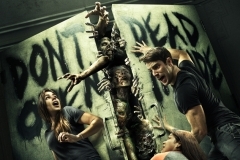 The attraction was announced at WonderCon on 26 March 2016, and follows on from the massive success of the TV show, and of the Walking Dead mazes at Halloween Horror Nights. It’s a welcome return for a year-round Horror attraction, following the removal of Universal’s House of Horror in 2015. Whilst that attraction was built into a fairly oddly-shaped former restaurant building, the new attraction will be in a new building behind the shops that form the new Universal Boulevard, near the main entrance to the theme park, on the Upper Lot. Universal City, California, May 18, 2016 – Universal Studios Hollywood reveals a behind-the-scenes look into the making of its new permanent walk-through attraction based on AMC’s record-breaking television series, “The Walking Dead,” and announces that the eagerly-awaited experience will debut on Monday, July 4, 2016. The captivating two-minute video features insightful commentary from Greg Nicotero, executive producer and director of “The Walking Dead” as he tours his LA-based special effects studio, KNB Efx, which is responsible for masterfully creating the show’s—and now the attraction’s—realistic decaying walkers. Please click here for the sneak peek. “After six years of working on ‘The Walking Dead,’ we have a great opportunity to take ‘The Walking Dead’ out of the studio, off the soundstage and into an attraction at Universal Studios Hollywood where guests can come face-to-face with walkers,” said Greg Nicotero. Universal Studios Hollywood has worked collaboratively with AMC’s “The Walking Dead” for years as a signature “Halloween Horror Nights” maze. This newly enhanced venture will take the highly sought-after experience from a seasonal, limited time offering to an exciting 365-day opportunity, raising the bar for themed walk-through attractions. To ensure authenticity of the attraction, Universal Studios Hollywood is partnering with “The Walking Dead’s” creative team, including Greg Nicotero and KNB Efx to develop prosthetics, utilize original molds and painstakingly apply paint and detailing to attraction walkers. The integral involvement of the creative team will not only inspire the emotional connection fans experience, it will be among the attraction’s key distinguishing characteristics that will define it as a living representation of the show. Coupled with authentic walker make-up effects, sophisticated animatronic walkers, substantially more detailed set design and costuming, and highly recognizable props replicated from the series, “The Walking Dead” attraction will deliver an uncompromised realistic environment that brings guests even further into the most watched show in cable television history. The “The Walking Dead” attraction will be located within an entirely new, custom built structure, situated within an expansive building complex just inside the theme park’s main entry. Due to the intense nature of this experience, the attraction is not recommended for guests under the age of 13. The past five years have been a remarkable time for Universal Studios Hollywood as the destination embarked on an unprecedented revitalization that has substantially altered over 75 percent of its familiar footprint to effectively characterize it as an entirely new theme park experience. The introduction of the all-new “The Walking Dead” attraction continues the theme park’s unparalleled investment in its ambitious epic transformation. AMC’s “The Walking Dead” depicts the story of survivors in a post-apocalyptic world overrun by hordes of terrifying flesh-eating walkers. It is the #1 show on television among adults 18-49 for the last four years and will debut its seventh season this October. UNIVERSAL CITY, Calif. – March 14, 2016 – Universal Studios Hollywood brings the most popular show in cable television history to life in Summer 2016 when AMC’s Golden Globe award-nominated television series, “The Walking Dead,” sets up permanent residency at The Entertainment Capital of L.A. in an all-new immersive, cutting-edge attraction. 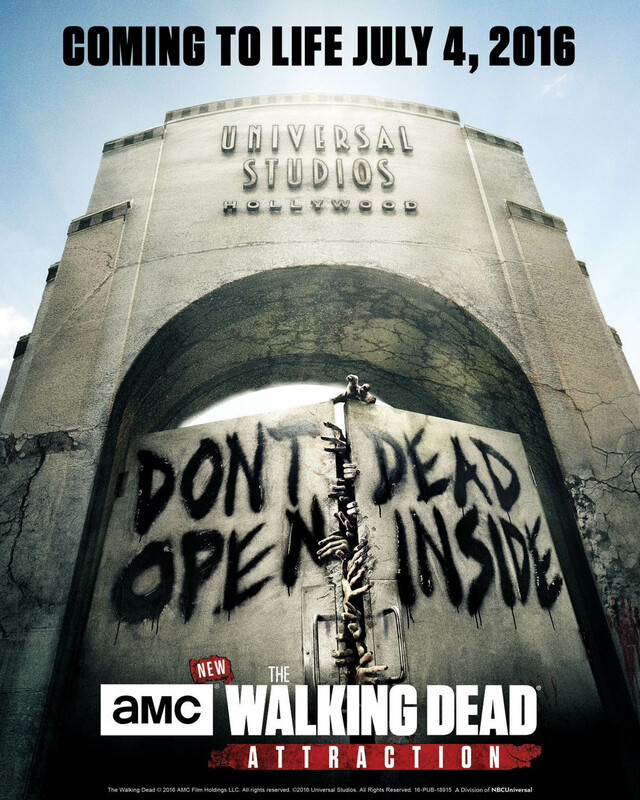 Universal Studios Hollywood has worked collaboratively with AMC’s “The Walking Dead” for years as a signature “Halloween Horror Nights” maze. This newly enhanced venture will take the highly sought-after experience from a seasonal, limited time offering to an authentic 365 day opportunity, raising the bar for themed walk-through attractions. For a look at what to expect when the attraction opens this summer, please click here. 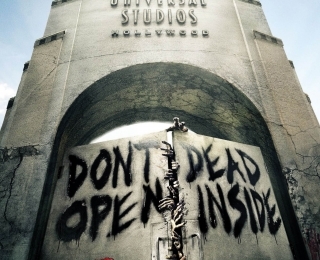 To further elevate the authenticity of this new attraction, Universal Studios Hollywood is partnering with “The Walking Dead’s” creative team, including visionary executive producer and director, Greg Nicotero and his special effects company, KNB Efx. Greg’s team, responsible for masterfully creating the show’s realistic decaying walkers, will construct prosthetics, utilize original molds and painstakingly apply paint and detailing to the attraction walkers. The integral involvement of the creative team will not only inspire the emotional connection fans experience, it will be among the attraction’s key distinguishing characteristics that will define it as a living version of the show. “The Walking Dead” attraction will create a no-holds-bar experience that significantly intensifies any other iteration previously developed within the theme park. 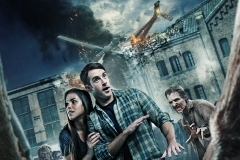 Coupled with authentic walker make-up effects, sophisticated animatronic walkers, substantially more detailed set design and costuming, and highly recognizable props replicated from the series, the attraction will deliver an uncompromised realistic environment that brings guests even further into the most watched show in cable television history. The “The Walking Dead” attraction will be located within an entirely new, custom built structure, situated within an expansive building complex just inside the theme park’s main entry. The past five years have been a remarkable time for Universal Studios Hollywood as the destination embarked on an unprecedented revitalization that has substantially altered over 75 percent of its familiar footprint to effectively characterize it as an entirely new theme park experience. The introduction of the all-new “The Walking Dead” attraction continues the theme park’s unparalleled investment in an ambitious epic transformation. AMC’s “The Walking Dead” depicts the story of survivors in a post-apocalyptic world overrun by hordes of terrifying flesh-eating walkers. It is the #1 show on television among adults 18-49 for the last four years and in its sixth season, the most highly-rated show in cable television history. More information is available at www.UniversalStudiosHollywood.com. Like Universal Studios Hollywood on Facebook and follow @UniStudios on Instagram and Twitter. Due to the intense nature of this experience, the attraction is not recommended for guests under the age of 13.